Mr Brown keeps telling us Armageddon arrived out of a clear blue sky, and it's all the fault of those damned Americans. Does anyone actually believe that? Many people have long been warning about how much debt we've run up over the last decade, and how there would have to be a reckoning. True, we've been shocked by the speed and ferocity of the collapse - a lingering 70s-style decade of jobless joylessness seemed more likely - but a reckoning there had to be. And we in the UK are set to suffer a worse reckoning than most other major developed economies, because we have been far more reckless than them in maxing the credit cards. The IMF has just published some striking charts showing how we compare. So on the IMF's analysis, UK households come out as the most indebted: more indebted than households in other major European economies, and actually worse than profligate US households. 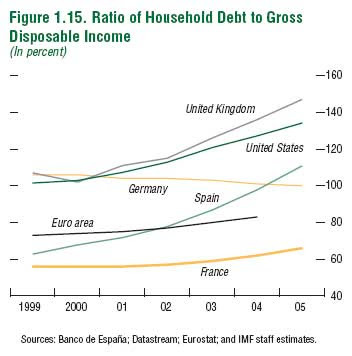 And just compare us to those prudent Germans, who have reduced their debt. Turning to our wobbling banks, a key issue is how much capital they have to support their lending - the more the better. But once again, we come out worse than other countries. 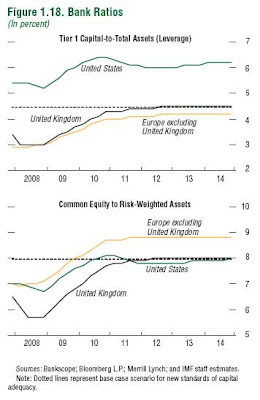 The following chart shows two key measures of banks' capital adequacy, and on both, higher is better. Yet on both we currently stack up very badly against both the American and European banks. As the chart shows, our banks need to increase their capital ratios by about one-third to get back into the comfort zone. So when Mr Brown tells us the problem has blown in from across the Atlantic, he's being more than a little economical. True, had the global debt bubble continued for ever, we might not have had a problem. But that's what's generally known as the Cloud Cuckoo Scenario. The real issue was always how we were going to fare when the global music stopped. And there his economic stewardship has left us with a major problem. For taxpayers the outlook is bleak. Because suddenly, we're not only shouldering that £1.8 trillion of on and off-balance sheet government debt (eg see this blog), but we're now effectively guaranteeing all our commercial bank debt. And that amounts to a staggering total of £6.5 trillion. Or over four times our annual GDP.